After a marathon day on Thursday, I had to peel myself out of bed early in the morning again on Friday. I had less golf in my plans for this day, though. It was partly because I had some business meetings in the afternoon and partly because rain was in the forecast for the late morning and early afternoon. I wanted to get out early and squeeze in a round or two. Normally, I would have tried to make an early tee time. I always feel better about having my name on the tee sheet rather than just walking on. However, when I looked at Dryden Park’s online times, they were for 2-4 players only. There were plenty available starting as early as 6:07, but I couldn’t book as a single. This is not too uncommon and it is what it is, so I made do. Since early times were available, my plan was just to show up around 6:00 and try to get out near the front of the pack at dawn. As I pulled into the dark and empty parking lot, I realized that plan may have been overkill. There was no “crowd” and the pro shop was dark. I got ready anyway and went over by the pro shop and first tee to mill around. It was still pretty dark and I knew no big groups of people were showing up anytime soon, so I was content to wait it out a little bit. Otherwise, I figured I’d just tee it up and then come around to pay at the turn. Again, it wouldn’t be the first time for that. Still, I prefer to avoid doing that at places I’ve never been to before. A few minutes later, another single player showed up and went straight to the first tee. As he was getting ready to go, a maintenance worker arrived and told me to go ahead and start playing when I wanted. I let the other guy go ahead and then followed as I walked the front nine. It was dark enough and then the skies were ugly that morning with a storm looming, so I apologize for the lack of any great pictures. It’s too bad because this course would have looked pretty sharp in the early morning sun (similar to some of the great images from the day before at Kings CC). Anyway, the front nine went smoothly. I was debating before the round if I wanted to walk or ride because I was so tired. When I went to check in, I decided to rent a cart for the back nine. 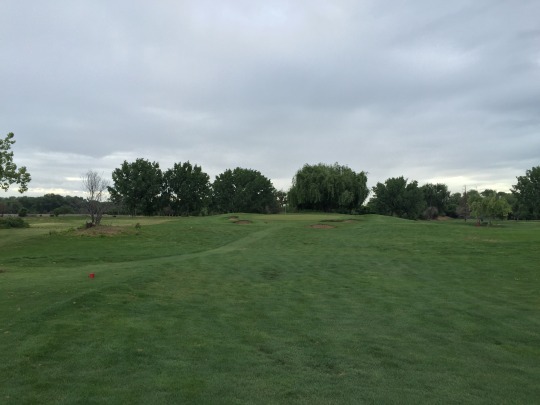 It worked out well as I got some extra exercise in the morning that kept me warmed up, but then got to rest my feet and back on the back nine. 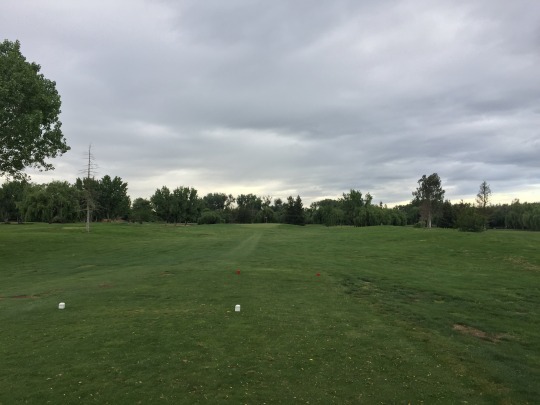 It also allowed me to breeze through it (I did have to play through the other guy at one point) as quickly as I could in order to make the most of the morning before the storm officially rolled in. Dryden Park is just down the street from Modest Municipal and has some similar characteristics. 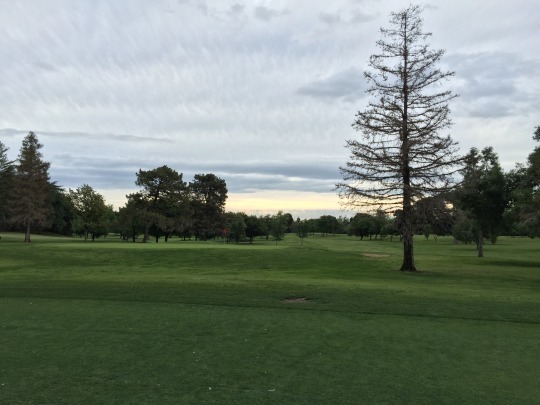 Yes, it is another very simple and “traditional” Central Valley kind of course with tree-lined fairways and generally flat terrain. 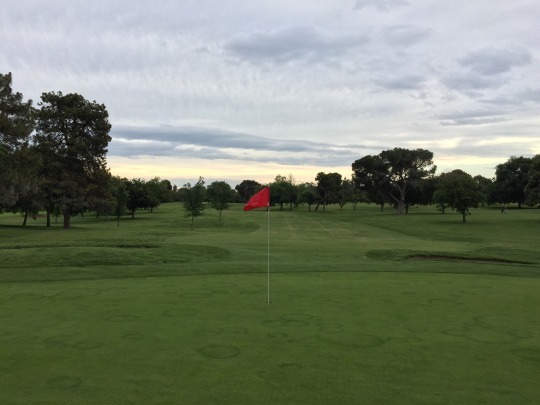 Most holes here are pretty wide open off the tee and the greens are accessible without too much undulation, so a good score can be had as long as you don’t spray it into the trees too much. 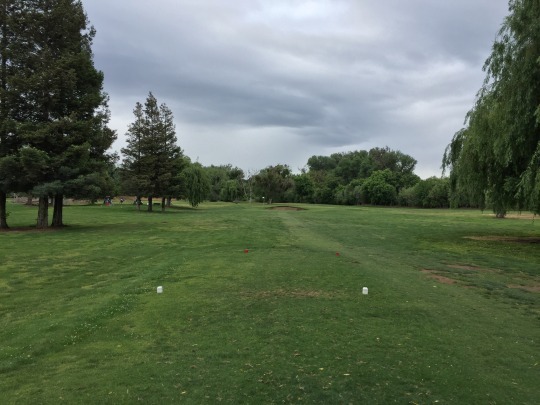 There are no water hazards, but a few holes do run along the edge of the Tuolumne River and that can come into play with a stray tee shot. Probably the most interesting hole here is the par-3 17th, primarily because it’s the only spot on the course with a noticeable change in elevation. It’s maybe a 20- or 30-foot drop from tee to green, but it’s at least something and it’s a fairly nice looking hole. 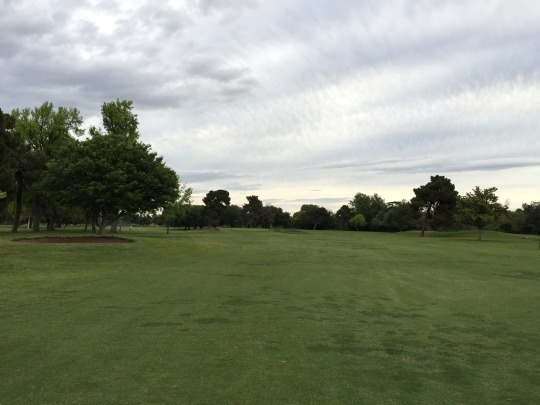 Speaking of par-3s, Dryden park has an unusual quirk in that both the 9th and 10th holes are par-3s. It’s rare enough to see one or the other, but especially both turn holes. After some of the previous reviews on Greenskeeper.org, I wasn’t sure what to expect here in terms of conditions. In fact, I had set my expectations rather low. 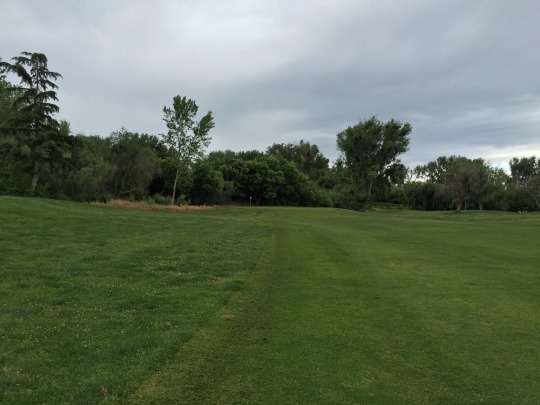 I was very pleasantly surprised as everything was pretty lush and green throughout the course. This is definitely a good time of year for this course. The tee boxes were generally nice. A few could use some leveling out, but there were no big issues. 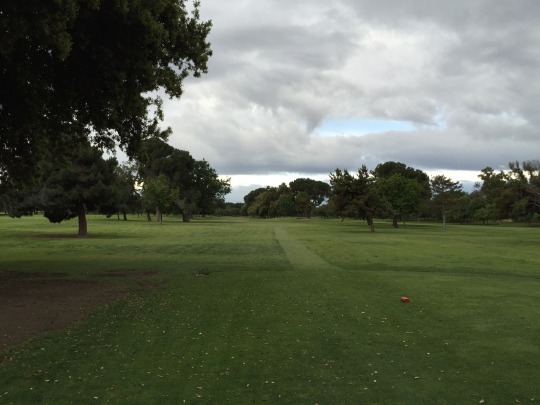 The fairways were quite good throughout the course. There were some weak spots here and there, but I almost always had ideal lies. The rough had pretty good coverage (mostly good grass and some clover patches mixed in) and was pretty difficult in spots. It didn’t seem super deep, but the ball would really settle in and recoveries were often tough. The sand traps were very good. 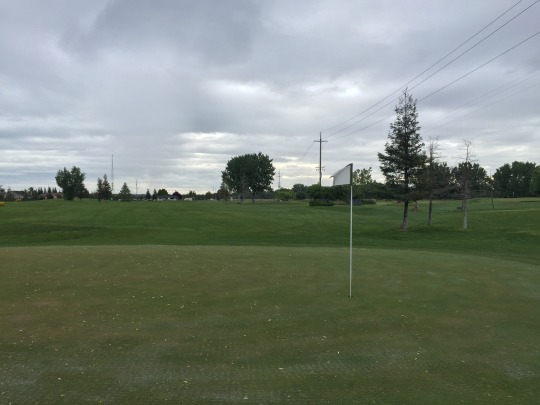 The greens were about 90% recovered from the recent aeration. They were soft and rolling pretty well at medium speeds. 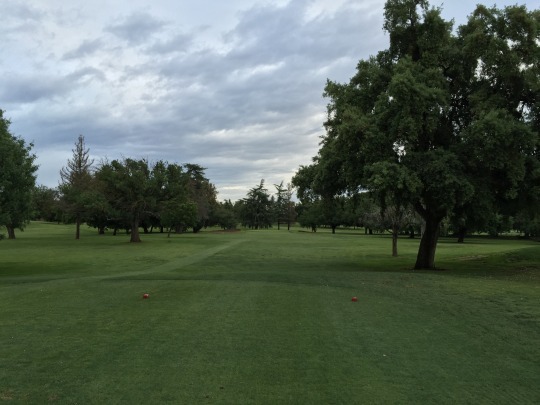 Dryden Park is certainly not a destination course and it’s nothing worth going too far out of your way for while in Modesto. I would probably still recommend Creekside first. Both are very forgiving layouts without too much challenge, but Creekside is a bit more interesting. Still, Dryden is solid enough for what it is and the conditions this time of year were nice. From the reviews I’ve read, though, this course certainly has its ups and downs throughout different parts of the year. After finishing at Dryden, I headed across the southeast part of town (technically into Ceres). My plan was to play the executive 18-hole course at River Oaks. 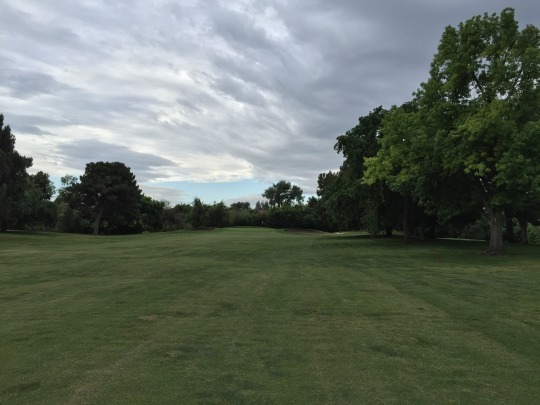 When I arrived, I could see the course was pretty empty and it would be a quick round. However, when I checked in, the lady informed me that one of the nines was closed that day because they were punching the greens. I was welcome to play the other nine (twice), but I am a completist and had to save River Oaks for another visit. 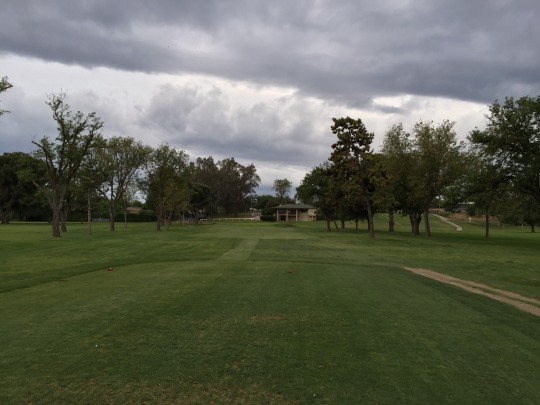 It did start to rain on me as I drove north, but it still seemed pretty light and by this point I was determined to at least going to go and take a peek at the course itself. 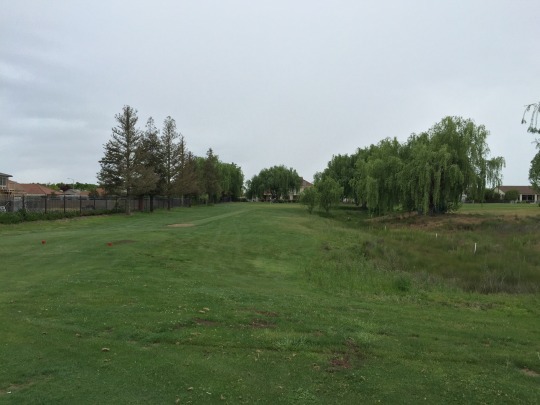 In my head, I believed it to be a 9-hole course and perhaps just a par-3 layout. When I checked in, the girl asked if I wanted to play nine or 18, which again affirmed my assumption of this being a 9-hole course. 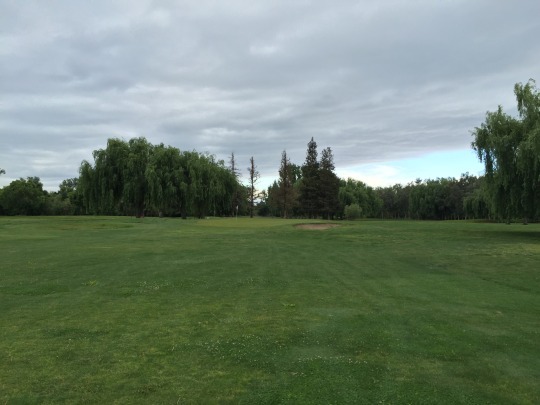 The price was $12 to walk nine holes. Though the place wasn’t packed, there were actually quite a few players out on the course for such an ugly day. As I was getting ready to head to the first tee, I looked at the quaint sign by the clubhouse showing the course map and information. I saw 18 holes clearly on display. With my tail between my legs, I had to go back in and pay extra for the full course. Also, I had to break down and get a cart just to play as quickly as possible. It ended up being $16 more, so $28 total for 18 holes with a cart. 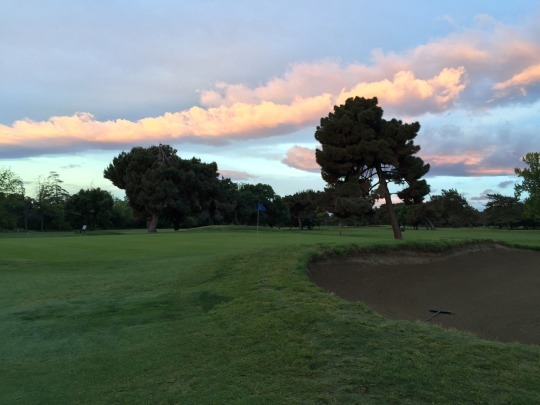 I never caught anyone on the front nine and then played through a twosome early on the back. By the 15th hole, I caught up to a group of old timers. They didn’t seem interested in letting me play through. There were only four holes left anyway, so I didn’t bother to push and just hung back as much as I could behind them. 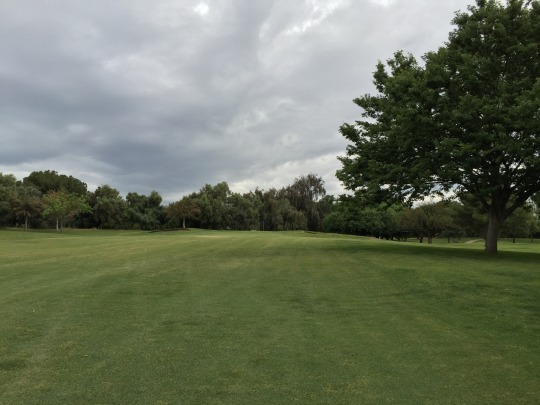 Jack Tone is a pretty simple local course. 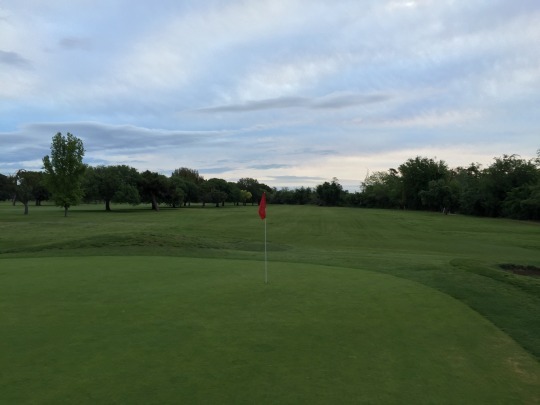 It plays to a par of 62 with six short par-4s mixed in and even a tricky little par-5, too. 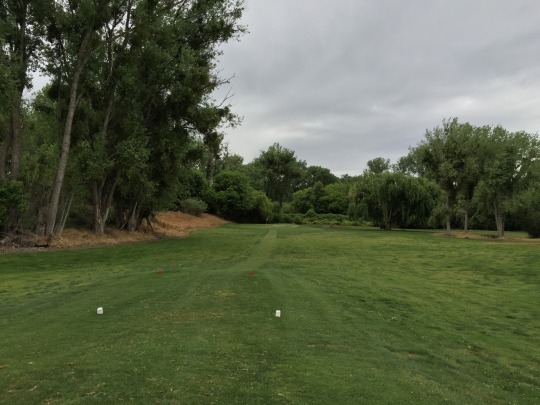 From the blue tees, it maxes out at 3,715 yards. Overall, it’s a decent mix of hole lengths for a course of this stature. 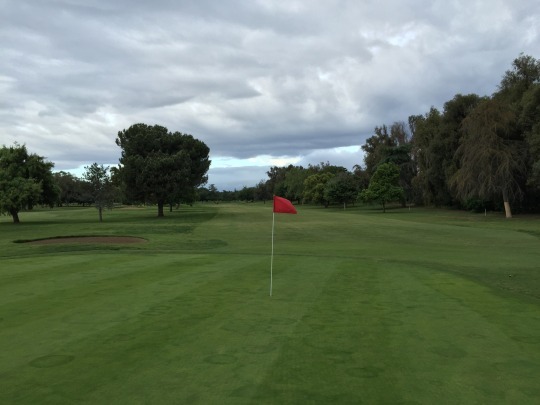 The layout isn’t very difficult and most holes/greens are pretty simple in design. It’s a very good course for beginners, seniors and kids to enjoy. 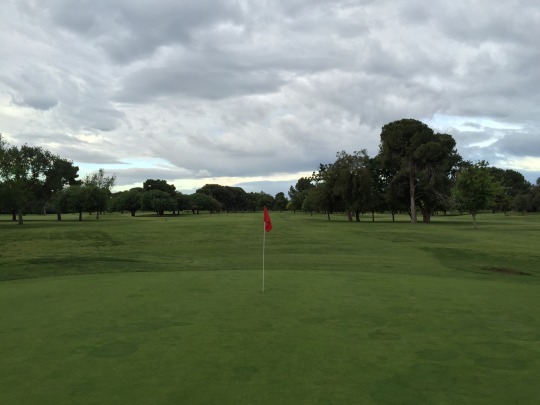 The greens here had also been aerated recently, so more sandy, bumpy and slow surfaces. They didn’t seem to be anything too great to begin with, though, so it was hard to tell how they might play when healed back up. 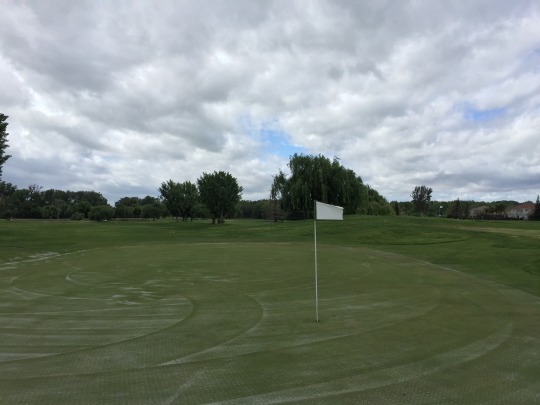 The rest of the course was in okay condition at best. It was pretty green out there as you’ll see in the pictures, but it didn’t seem to play as nicely as it looked from a distance. 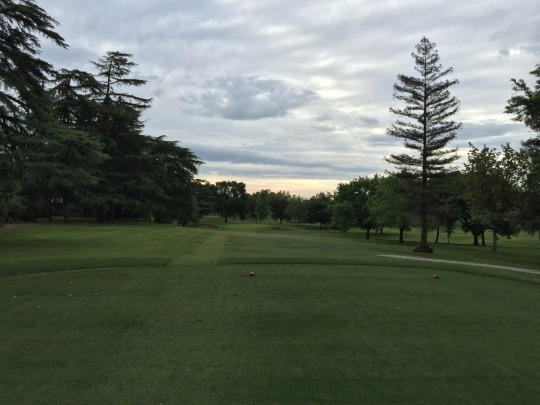 I will say the fairways on most of the longer holes were pretty decent. Everywhere else, I just didn’t know what kind of lie I might get. Usually more bad than good. Again, Jack Tone exists as a simple and affordable locals’ option, so most people will not bother to play here unless on a silly quest to play everything. I understand and appreciate the short courses like this. The staff was super welcoming and the big shop dog, Zeus, was out there to greet everyone. 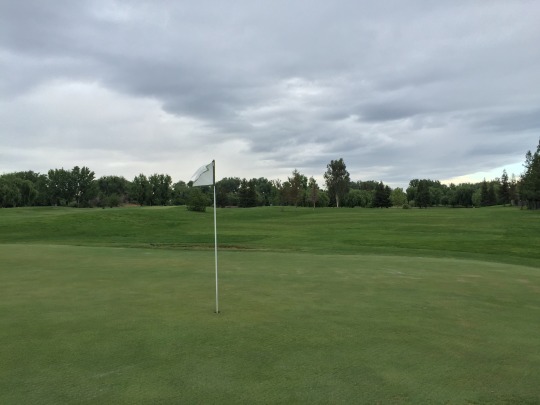 It’s a friendly place with a dumpy little course that serves its purpose well enough. 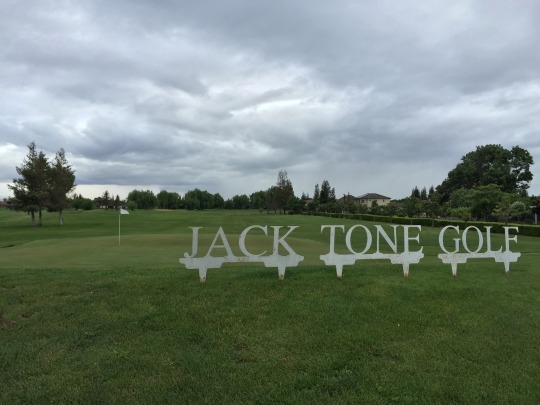 In case you are wondering who the heck Jack Tone is/was, I guess the Jack Tone Ranch is a famous old horse ranch located in nearby Stockton. In fact, it is the oldest continually operated horse ranch in California (1849). 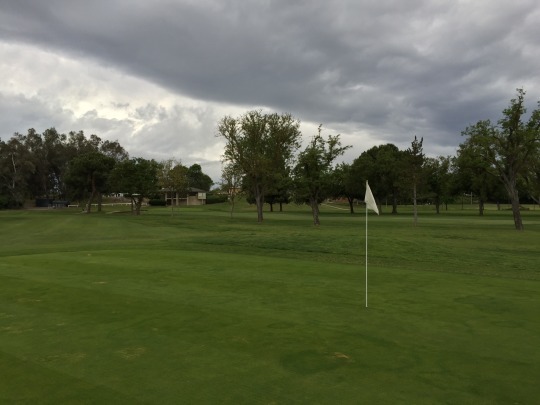 I don’t know if there are any other connections between the golf course and the ranch and/or Tone family.